This paper advances five linked and controversial propositions that have both deep historical roots and urgent contemporary relevance. 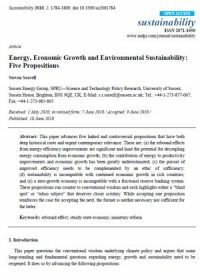 These are: (a) the rebound effects from energy efficiency improvements are significant and limit the potential for decoupling energy consumption from economic growth; (b) the contribution of energy to productivity improvements and economic growth has been greatly underestimated; (c) the pursuit of improved efficiency needs to be complemented by an ethic of sufficiency; (d) sustainability is incompatible with continued economic growth in rich countries; and (e) a zero-growth economy is incompatible with a fractional reserve banking system. These propositions run counter to conventional wisdom and each highlights either a - blind spot‖ or - taboo subject‖ that deserves closer scrutiny. While accepting one proposition reinforces the case for accepting the next, the former is neither necessary nor sufficient for the latter.